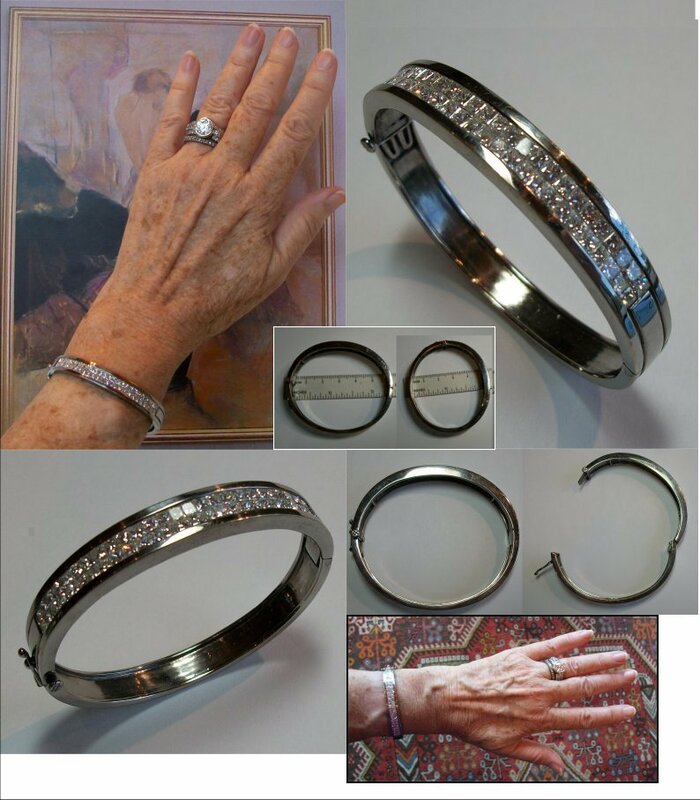 The appraisal reads as follows: "Ladies 18k white gold hand-made invisibly set double row diamond bangle bracelet. The bracelet contains two rows of 26 princess cut diamonds invisibly set in a single channel. All the diamonds are matched for clarity and color being G in color and VS2 in clarity. The total number of diamonds are 52 and the total diamond weight is 5.20 ct."
The bracelet's weight is 25.7 DWT = 1.285 Ounces = 39.9635 Grams . The appraised value of this bracelet was shown as $17,500. on Jan. 17, 2005. The bracelet is very beautiful and it is in excellent condition.